The SpaceX Dragon cargo spaceship is grappled by the International Space Station's Canadarm2. The spacecraft delivered about 7,000 pounds of science and research investigations on April 10, including the Bigelow Expandable Activity Module (BEAM). 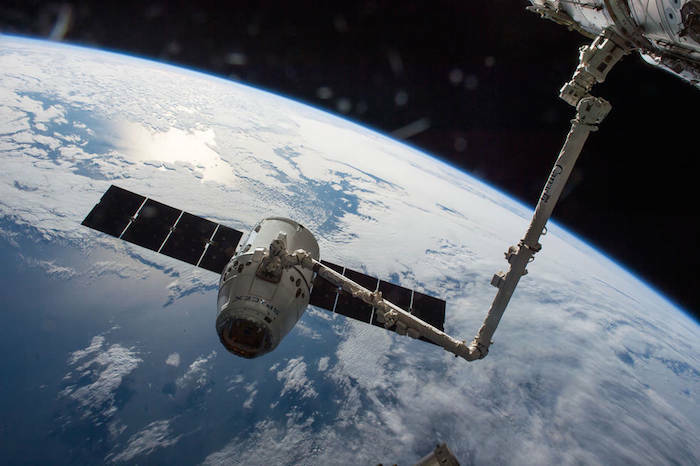 After delivering almost 7,000 pounds of cargo to the International Space Station, including the Bigelow Expandable Activity Module (BEAM), the SpaceX Dragon cargo spacecraft is set to leave the orbital laboratory with valuable science research and return to Earth on Wednesday, May 11. NASA Television will provide live coverage of Dragon's departure beginning at 9 a.m. EDT. The Dragon spacecraft, which arrived at the station April 10, will be detached from the Earth-facing side of the station's Harmony module using the Canadarm2 robotic arm, operated by ground controllers at NASA’s Johnson Space Center in Houston. Robotics controllers will maneuver Dragon into place and Expedition 47 robotic arm operator Tim Peake of ESA (European Space Agency) will execute the command for its 9:18 a.m. release.